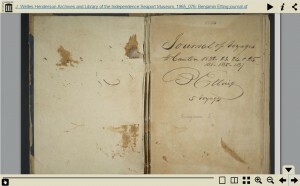 Click image to view the journal in a page-turning viewer (but see note on inverted pages). Journal kept by Philadelphia merchant Benjamin Etting on voyages to Canton, China, 1822-25; 1831, 1835, and 1837. Entries remarking on weather, landmarks seen, length of passage. Volume also includes lengthy memorandum entitled, “Custom & manner of doing business in Canton,” which offers practical advice to American merchants dealing with Chinese pilots, manufacturers, government officials, et al.